First of all, here are some links I thought y’all might enjoy. – On Thanksgiving Day YouVersion is releasing the Bible App for Kids. I got to preview the app earlier today, and y’all, it is awesome. Kids are going to love it. The illustrations are great, and the whole thing is interactive. The download is free, and you should be able to find it in the App Store first thing Thursday morning! – I talked to Travis a couple of hours ago, and he told me that I really needed to download The Isaacs’ version of “The Living Years” (think Mike & the Mechanics circa 1989). He was so enthusiastic that I bought the song while we were on the phone, and about thirty minutes later, when I left to pick up supper for D and me (Alex is with family in Mississippi), I decided to give it a listen. No kidding: within fifteen seconds I was fighting the ugly cry. Normally I would’ve surrendered, but I just got new contacts today and I was scared I would lose one of them while I was driving. But make no mistake: this is one of the most beautiful songs I’ve heard in a long time. You can download the song on iTunes. STINKIN’ GORGEOUS. And what a word. – I am just starting to think about decorating for Christmas, but I know for sure that there’s something new I’m adding to our house this year: Christmas Rules Subway Art Print. Isn’t it fun? I love having a framed print that I can move around each year – whether I prop it up on a buffet, set it on a window ledge, or hang it in my kitchen. Plus, it comes in a few different colors, including this very festive red. They do mighty good work at Alexander Creative. And obviously this is not to be confused with the Wall Hanging of the Grievances that Melanie and I mentioned on the last podcast. Oh, heavens no. – If you’re going to be on the road during Thanksgiving, don’t miss Dave Barnes’ new Christmas CD. I know I’ve mentioned it before, but it gets even better the more we listen. Instant classic. Finally. And second of all. Kinda. Late last night I realized that today is my 8th blog anniversary. Or 8th blog birthday. Honestly, I don’t really know if it’s an anniversary or a birthday, but I do know that I started this blog 8 years ago, and I still can’t get over the fact that I’ve stuck with it. I think you get the idea. The fact that I’ve stuck with this blog is a wonder. But I have loved it. And I still love it. And I’m forever grateful for y’all and the fact that you stop by and read and comment and make me laugh. I can’t ever thank you enough. Well. I had the best time this past weekend. And believe it or not, it had absolutely nothing to do with college football. I mentioned last week that I was speaking at the Arkansas Women Bloggers conference, and that is exactly what I did. Friday morning I flew to Atlanta so that I could fly back over Birmingham on the way to Little Rock. And by the way, do you know how long it takes to fly from Birmingham to Atlanta? THIRTY-ONE MINUTES. I mean, yes, you have to make time to taxi and take off and descend and land and taxi again, but you are really only in the air long enough to watch one episode of your favorite sitcom – and you can’t even do that because for at least ten minutes of the flight all of your electronic devices have to be turned to the “off” position and stowed. For some reason all of this fascinates me. 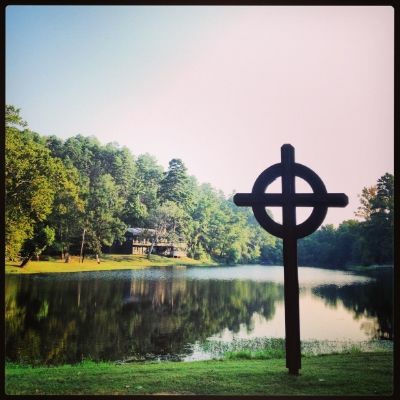 Anyway, the conference was at Ferncliff Camp outside of Little Rock, and the setting was absolutely beautiful. There were trees and hills and wide-open skies, and lo, my heart was full. The rooms weren’t fancy, but they were charming, and I really do think that I’m growing as a person because even though THERE WERE NO TELEVISIONS THERE, I did not panic. I took several deep breaths, reminded myself that there was plenty of wifi (even if it wasn’t powerful enough to live stream a football game), and remembered two words that can be very important during an unexpected TV-free weekend: CANDY CRUSH. Listen. I’m as bad as it as I ever was, and it’s certainly not any sort of all-consuming thing with me. But it was a great way to pass the time on my flights, and I actually bonded with a woman in the Birmingham airport when we discussed some strategies that might help her get past level 22. I told her about combining the wrapped candies with the striped candies, and she was so excited that she nearly jumped up out of her seat. Obviously it was a special moment that I will treasure forever. As it turned out (and a little bit to my surprise), I didn’t have a whole lot of time to play Candy Crush. I did, however, get to meet a bunch of blogging women who couldn’t have been more warm, welcoming, and fun. I got such a kick out of their DEEPLY genuine sense of community, and I loved watching how they support and encourage each other. My friend Stephanie started the conference a couple of years ago; she and her team have done a phenomenal job. I enjoyed my time there so much. And if all of that weren’t enough, I also got to see my friend Jennifer (we went to State together), and about six different times yesterday we laughed so hard that we couldn’t make any sound come out. My heart was so happy to see her. So, in summary: Great conference. Wonderful women. Sweet friends. And the view wasn’t bad, either. You made me feel right at home. If you’re anything like me, this video will make your heart soar. And also sing. IT WILL MAKE YOUR HEART SOAR AND SING! It’s hard to explain, but there’s something special about some jazz hands choreography performed by men wearing tuxes and women wearing sah-weet Hanes Silky Reflections hose in Off Black. And when you top it off with an appearance by Kathie Lee Gifford as well as her green taffeta sash – well, it just screams “AMERICA, LAND OF THE FREE” to me. Oh, I adore this country and its fancy production numbers. So, in the spirit of celebrating the parade of states, big hair, sparkly evening gowns and SWEET MERCY, THE TALENT COMPETITION, I’d love it if you’d swing by here next Saturday night, January 14th, for a Miss America Viewing Party. Since the pageant is being televised on ABC this year, it should be pretty easy for most of us (the ones who are interested, at least) to tune in. And if you’re at all curious about how this little viewing party will work, you can take a look at what happened this past summer at our Miss Mississippi Viewing Party (also known as MY FAVORITE BLOG-RELATED MEMORY OF ALL TIME). Hopefully it’ll be big fun for all involved – whether you’re writing comments or just reading them. I can’t wait! I may even have to set up a pre-pageant tailgate party in my living room. Or maybe I’m just looking for an excuse to make lots of dips. Nonetheless, I’ll be here with bells on. Or a crown on. Or some clogging shoes on. WHATEVER IT TAKES. About three years ago I flew out to San Antonio to meet Melanie at a Living Proof Live event at the Alamodome. The plan was that Melanie and I would blog about the event like we normally do (over at AllAccess), and then afterwards we were going to help out at a Q&A session featuring Beth Moore and her daughters. If memory serves, the idea was that Mel and I would be responsible for some “witty banter” with the women who were waiting to attend the Q&A. In retrospect I think we were probably supposed to be like those warm-up people at talk shows – the people who try to keep the audience from getting too bored while they’re waiting on the people they really want to see. And let me just tell you: that day in San Antonio, there were a bunch of women who reallllly wanted to see Beth, Amanda and Melissa. Which is understandable because, well, they’re darlin’. In the weeks prior to the Q&A, Melanie and I talked about some possibilities for our “witty banter.” We figured there would be about 200 people there (in a small-ish conference room of some sort), and of those 200, we sort of (naively) assumed that maybe half of them would have read our blogs because we’d met and hung out with several of the women who were going to the Q&A. So, since Mel and I both enjoy procrastination and since we both felt like everything would go pretty smoothly if we were “bantering” in a room among friends, we decided on a very general approach and figured we’d come up with some specifics once I arrived in San Antonio. Oh, our plan was flawed. Our plan was very, very flawed. For so many, many reasons. First of all, my flight from Houston to San Antonio was cancelled, so I ended up pulling up to our hotel on two wheels about 45 minutes before we had to be at the Alamodome on Friday night. We ended up going to a late supper after the event, and we rolled back into the hotel at approximately 12:00 in the AM. Which makes perfect sense when you consider that we needed to wake up at 6:00 the next morning and then be responsible for witty banter later in the day. And then, once we got settled in at the hotel, the insomnia hit. OH MY WORD DID IT EVER. Melanie and I are both what you might call High-Maintenance Sleepers, and have mercy did our collective sleeping crazy ever kick in that night in San Antonio. Both of us enjoy a sound machine when we sleep, but unfortunately both of us had left our sound machines at home. As a result, our room was so quiet that we could hear EVERYTHING going on in the hallway of the hotel. At one point we got so desperate that we turned on the water in the bathroom sink to see if that would mimic a sound machine and therefore SOOTHE OUR INCREASINGLY FRAYED NERVES, but it didn’t work at all. I finally drifted off around 3, only to wake up at 5 and find a wide-eyed Melanie sitting on the bathroom floor with her laptop. She was typing a blog post. I don’t know why this would surprise you. All that to say: we were exhausted when we got back to the Alamodome Saturday morning. The looming banter took a backseat to the fact that we were both a little desperate for sleep. And then, before we were even remotely prepared, the event was over and it was time for us to take our witty banter in front of the 200 women. Only – TRUE STORY – there were actually about 1,000 women LINED UP ACROSS THE FLOOR OF THE ALAMODOME, and I would venture to say that approximately 993 of those women were wondering who in the world we were and WHY IN THE SAM HILL they were being forced to listen to us. To their credit, nobody actually screamed “WHERE’S BETH?!? !” when we walked out to the middle of the floor, but I guarantee you that most of those women were thinking it. There are so many things I could tell you about those fifteen minutes of my life – those fifteen minutes THAT STRETCHED OUT FOR ALL ETERNITY – but I really don’t think there’s anything I could say to make you understand just how deeply, completely, filled-to-overflowing-with-awkward it all was. I mean, I’ve watched TV shows where someone stepped up to a microphone and froze, but I’d never experienced it firsthand until that fateful August afternoon. Melanie and I just, I don’t know, STOOD THERE, and all those women just, I don’t know, STARED AT US, and Melanie and I kept looking at each other and then looking at the women and then looking at each other and then looking at the women and IT NEVER GOT ANY BETTER, OH NO, it just became increasingly more painful and cringe-worthy with every passing second. And then I looked at her and laughed nervously and launched into a seemingly endless description of our sound machine woes and how we turned on the water and then I found Melanie in the bathroom at 5 and OH MY LANDS IT’S LIKE I’M SPEAKING TO A FIELD OF CRICKETS AND BY THE WAY THE CRICKETS AREN’T EVEN SMILING. After about five minutes we had the good sense to ask Travis to join us, and he totally saved the day (because, you see, the people there knew who he was, and they seemed to appreciate seeing a face that was infinitely more familiar to them than the faces of the two blogger people who couldn’t seem to do much more than stammer). Travis actually created some interaction and some fun (which, of course, was supposed to be our job, but we’d fired ourselves by that point), and somehow we made it to the end of our little segment. I’ve never in my life been so happy for something to be over. And even though it was pretty epic in its terribleness (no kidding: I think the term “EPIC FAIL” was coined as a direct result of what happened on the floor of the Alamodome that afternoon), I like to think that the 993 women/crickets forgot all about Mel and me as soon as Beth and her girls came out on the floor for pictures and the Q&A. Anyway, I’m sharing this NEVER ENDING TALE with y’all today because it adds an element of SWEET, SWEET IRONY to the fact that this weekend Melanie and I are the emcees for the .MOM Conference here in Birmingham. Once again Mel and I will be like the warm-up people on talk shows – only this time we are going to be PREPARED, yes ma’am we are. There are some real-live people who have worked like crazy to help us get ready for our emcee-related responsibilities, and we’re really excited about it. And also terrified. But still: really excited. So, given all of that, I’m going to take a little bloggy break for the next few days. Tomorrow Melanie and I will hit the ground running just as soon as I pick her up from the airport, and you’d better believe we’ll be rehearsing for our emcee duties this time around. Several times, in fact. LESSON LEARNED, ALAMODOME. YOU TAUGHT US WELL. I hope that some of y’all will be at .MOM, and I also hope that you’ll come say hey if you’re there. Mainly because Mel and I will probably need a hug. And a pep talk. And then another hug. …but does anybody have any interest in participating in a little impromptu DipTacular this Wednesday? College football starts Thursday, you know, and since our last DipTacular was a couple of years ago, I thought maybe y’all might have some new dip recipes to share. Here’s how it would work: on Wednesday you’d post two or fourteen of your favorite dips on your blog or Facebook page (you could post your recipes as a note and then make sure your note setting is public), then you’d copy the URL of your blog post and add it to a Mr. Linky that I’ll have posted here. I’m assuming, of course, that everyone still enjoys dip. Perhaps the dip landscape has changed in the last two years. Maybe cupcake craze has dictated that cupcakes are the new dip. But with football season just a few days a way, I can’t help but think that at least a few of us would enjoy some dip-related inspiration. No pressure, though – and if nobody’s up for it I’m sure we’ll all still be able to find some new and exciting uses for cream cheese this fall. I just figured that it couldn’t hurt to ask. So if you’re interested, just leave a comment. If there are at least, say, 25 people who are game, then we’ll plan to have a little dip party on Wednesday.